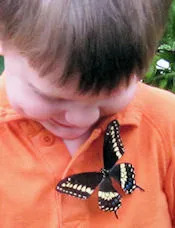 Raising a Black Swallowtail butterfly indoors is fun, easy, and educational. Black Swallowtail butterflies are great to raise indoors for several reasons including abundance, plentiful food source, attractive and interesting caterpillars, and of course beautiful butterflies. 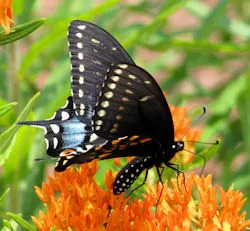 The Black Swallowtail can be found anywhere East of the Continental Divide in America. The Anise Swallowtail is the Western version of this butterfly and is surprisingly different in appearance considering the caterpillars and chrysalises are nearly identical. The host plants of the Black Swallowtail butterfly include such plants as carrots, parsley, dill, fennel, Queen Anne’s Lace and rue. 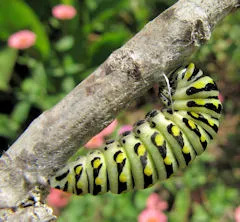 The Anise Swallowtail caterpillar feeds on anise as well and reportedly citrus plants also. Many of these plants can be found relatively easily in garden centers and nurseries around the country. That makes it easy to find host plants to plant and to get more food for your caterpillars if you find yourself running low. However, there is a risk that the growers used pesticide on the plants which will kill the caterpillars. Ask before you buy and be sure to clean (rinse) the vegetation once you get it home. It’s always best to grow your own if you can but that is not always practical for everyone. Although it is not generally recommended, I have always had success using parsley from the grocery store in a bind. This is a bit risky because, again, it is unknown how that parsley was grown. It may have pesticides on it. I have rinsed it thoroughly and it has worked for me. Personally, I feel that if it kills my caterpillars then I’m not so sure my family should be eating it either and I would definitely let the grocery store know about it! Once you figure out what host plant does best in your area, be sure to plant a bunch of it in the spring/summer to attract egg-laying butterflies. Parsley has worked well in my area in the Southeast where as Dill has not been so great because it just seems to dry up too early before the end of summer. My favorite (and the butterflies favorite) is the rue plant as a host because it is an attractive and reliable perennial and is also a host plant for Giant Swallowtails. Also, planting nectar plants will help to attract butterflies. Butterflies get their food from the nectar in flowers. Black Swallowtails are reported to especially like Milkweed, Phlox, Red clover and Thistle. In my yard I have seen them on Homestead Purple Verbena quite often and they love my Zinnias as well as the Milkweed family of plants. Finding butterfly eggs of the Black Swallowtail is not too hard. In my experience Black Swallowtail eggs are usually found on the top of leaves. The eggs are tiny white/yellow spheres (there are several pictures in the Butterfly Egg Photos section of this website). You can bring the eggs inside on the leaves or wait until the caterpillars hatch out and grow a little. If the eggs are laid on a potted plant you may want to bring the whole pot inside. If the eggs are on a plant in the ground you can bring some cuttings in or wait. The caterpillar will change a lot in appearance as it grows. When it is young it is black with a white stripe in the center. Shortly before it pupates it will look like the pictures below. Even as an adult caterpillar they can vary in coloration. They are all striped but some have alot of white, others have much more green and some are very dark looking with a lot of black. They have all turned into healthy butterflies. Don’t wait too long to bring them in or you will start losing caterpillars to their natural predators. Depending on how many caterpillars I already have indoors (and how much food I have) I sometimes only bring a few in and leave the rest outside to fend for themselves. Usually their numbers dwindle rather quickly. It is estimated that only 1 out of every 100 eggs laid will make it to a butterfly. We have used both an open and enclosed caterpillar home for Black Swallowtails. 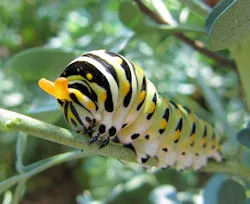 However, the Black Swallowtail caterpillar loves to roam right before it gets ready to pupate so you may want to keep these caterpillars enclosed as they grow or just enclose them once they start to get big. Enclosed is much easier but I invite you to read our article about indoor caterpillar homes for more information including the plusses and minuses. When the caterpillar reaches the size of about 1.5 inches (or about the size of the caterpillar pictured on my daughter’s hand) it will be ready to pupate. Also, these caterpillars make a dime-to-quarter size green mess as they purge undigested food shortly before pupating so if they are not enclosed you may want to put some newspaper under the caterpillars home. Another interesting note about this caterpillar is the osmeterium (harmless to humans). It is probably the only possible negative (if it even is a negative) to raising any of the swallowtail caterpillars indoors, but it is such an oddity that the interest overcomes the negativeness. The osmeterium is shaped like a two prong fork that is right behind the caterpillars head. The osmeterium of the Black Swallowtail caterpillar is bright orange and pops up to let out an unpleasant smell when the caterpillar is touched or disturbed. My children get a kick out of touching the caterpillar and watching the osmeterium pop out then disappear again. The smell has been described to be foul or like rotten cheese. It is certainly not pleasant but not intolerable either. I encourage them to only do it with the outdoor caterpillars and to wash their stinky hands when they are done! One more note about the Black Swallowtail caterpillar: it is safe to humans to hold and touch the caterpillar. It is not always safe for the caterpillar, however. The smaller they are, the more delicate they are. Also, they will molt as they grow (see life cycle of a butterfly for more information). When they get ready to molt they will stop eating and stay still for around 24 hours then crawl out of their old skin. During this time they are delicate and should not be moved. 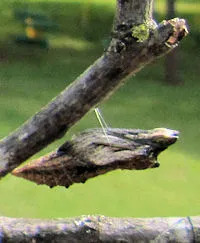 When the caterpillar gets ready to pupate it will scrunch up along a stick or stem and then spin its silk. It will attach itself to the stem/stick like a telephone lineman hangs on a pole with a belt. The caterpillar will use a belt of silk as well as attach its base to a patch of silk. When it is ready, (about 24 hours after attaching) it will wriggle its outer skin off exposing the chrysalis beneath. The chrysalis will either be green or brown depending on the color of the surrounding area. In 1-2 weeks the butterfly will emerge. This usually happens in the morning hours after the sun has come up but I’ve had just a few come out in the early afternoon also. The butterfly has to be able to hang with its wings down (see life cycle of a butterfly for more information) so if some sticks or leaves are close to the chrysalis then you may want to clear them before the butterfly comes out. After several hours the butterfly will be ready to fly away. Often times when they get close to being ready and start fluttering we will carry them outside on a stick (or my kids love to have the butterfly hold onto their fingers). If they are not quite ready for flight we will put them on a stick in a pot or on a plant in the sun where they can finish. Black Swallowtail butterflies overwinter in the chrysalis. So, if your chrysalis does not form until late summer then it may not come out of the chrysalis until the following spring. To read more about this please visit How to Overwinter a Chrysalis. There are many different ways to raise a Black Swallowtail butterfly. You have choices in type of indoor caterpillar housing, whether you start with an egg or caterpillar, how you feed them (potted plant or cuttings) and how/when you release them. This article shares our experiences with Black Swallowtail butterflies but many different methods will work. Once you give it a try you will find what works best for you. It is truly a spectacular experience and I hope you enjoy it as much as we do. This entry was posted in Butterflies and tagged black swallowtail, raise indoors. Life Cycle of a Butterfly: Amazing! Our butterfly information is constantly growing as we add new posts. Please Contact Us if you have suggestions on helpful butterfly topics! © 2014 Joyful Butterfly | Website Designed by Web & Moore, Inc. 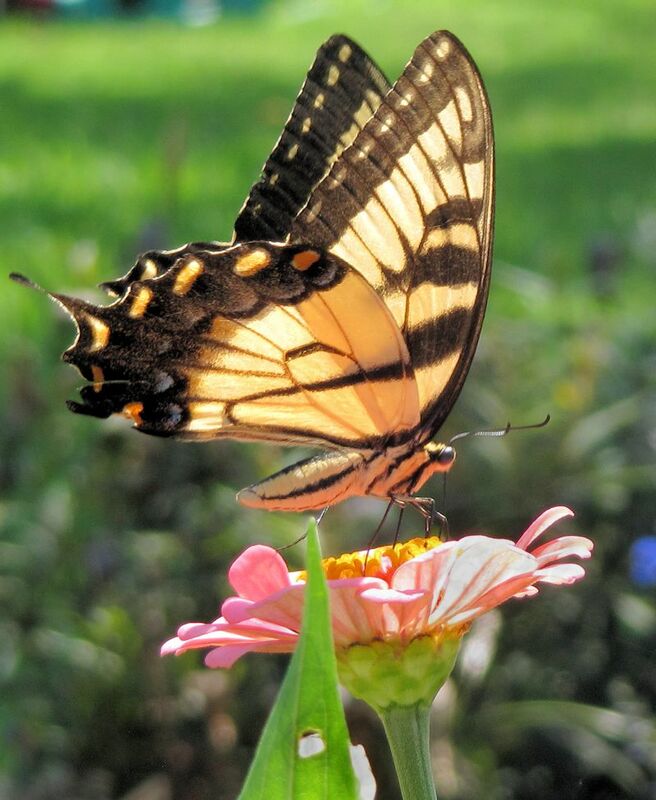 Newsletter for butterfly tips, sales, new products, coupons and more…! 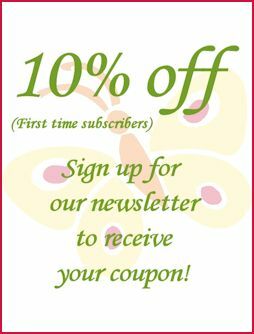 Subscribe to our newsletter for sales alerts, coupons, and Butterfly/Garden info!